SJ: Thanks for allowing me to feature you on my website. Please tell us about yourself: where did you grow up, when did you start playing music, what instruments do you play? WR: First of all I was born 1950 in Hamburg where I grew up and lived for about 20 years. When I was 14 years old I started to learn and play electric guitar. At that time the Beatles, Rolling Stones, The Who, Yardbirds and many other bands were just coming up and getting famous. And of course like so many others I tried to copy as much song material as I could get at that time. In Hamburg there was the world-famous live music STAR CLUB – and at least three times a week I went there to see countless famous bands like the Searchers, Small Faces, Kinks, Spencer Davis, Pretty Things, Taste with Rory Gallagher, Free, Procol Harum and many more. Furthermore there were two concerts halls in Hamburg where I saw The Beatles, The Rolling Stones, The Beach Boys, Jimmy Hendrix, Led Zeppelin, The Bee Gees, Jethro Tull, Roxy Music, Chicago, Queen, ABBA and many more……. So all these bands and many others had a big influence on me but it was mainly the Rock and Blues music in which I was interested most. At 15 I had my first band and the next few years I played in several different bands, playing different kinds of music – from Rock music to Dance music wearing even a tuxedo sometimes. In 1979 I got an offer to join a so called “TOP 40” cover band which was the No. 1 band at that time in northern Germany. The next 9 years I played about 100-120 gigs per year with this band – besides my 5 day full time office job! This was a very hard time – often enough I played 3 gigs on a weekend and returned on Sunday night at 3 or 4 o’clock a.m. and had to get up at 7 o’clock next morning to go to work. And such gigs were not a one or two hour show – we normally had to play from 8:00 p.m. to 2:00 – 3.00 a.m. ! After 10 years I was really burnt out and quit the band. But after a half year break I started again to form a new cover band covering mainly “oldie music” from the 60’s, 70’s and 80’s. I played with this band nearly 18 years – but we did’nt do more than 20 gigs per year. So, this is my experience and my musical roots ! Regarding my instruments: all the years I played mainly electric guitar and in the mid 80’s a little bit Pedal Steel guitar. SJ: I have to admit that I am more or less completely ignorant about contemporary German culture and especially the music scene. So…tell us: what’s the local music scene like? Do Germans listen to/prefer local/regional musicians & singers? What kind of American musicians are popular in Germany? WR: I think the music scene in Germany is similar to so many other European countries. I’m still living near Hamburg which is definitely a cosmopolitan city where you can find all kinds of music. Many top acts have always come to Hamburg and since we have had a new and very big concert hall, even more famous international acts stop by in Hamburg. And of course we have local/regional musicians and bands which are famous over here and are filling big concert halls. American Rock, Pop, Hip Hop etc. musicians who are famous in the US are famous in Germany and other European countries as well. But unfortunately Country and especially Bluegrass music is not so popular and widespread over here – that’s why many famous US Country or Bluegrass musicians are largely unknown in Germany. And although there is a Bluegrass scene (which is unfortunately very very small) most people have never heard about it and do not know what Bluegrass is at all. SJ: What is the “live” music scene like where you live? What kinds of bands/music can you see at a club or concert hall? What kind of gigs are available to a performing musician? WR: There is definitely a lot of live music in Hamburg with lots of different kinds of music but Country or Bluegrass music unfortunately plays only a small or hardly any part here. There is a small “Live Club” where a so called “Blugrass Session” (open stage) is held once a month. But you’ll mainly find musicians coming to this session and only very few interested visitors. And for Bluegrass music you can rarely find gigs and opportunities to perform. This is also the reason why there are hardly any Bluegrass bands over here. SJ: What was your first exposure to the dobro? 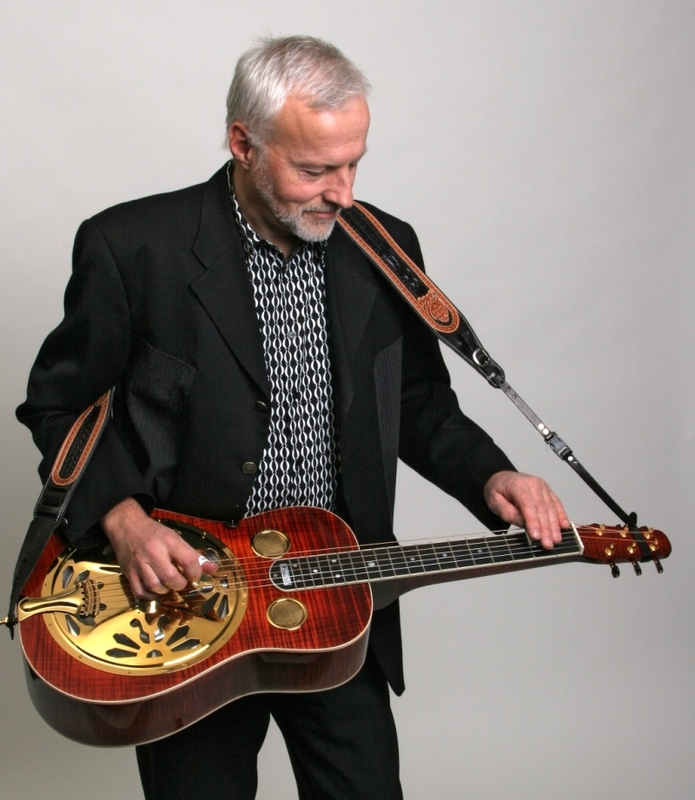 Where/when did you first hear the dobro; what made you decide to take it up? What’s it like to be a “dobro guy” in Germany and/or Europe? What kind of gigs do you get and what kinds of instruments/musicians do you play with? WR: I was a fan of Country music for many many years and in the 90’s I heard and saw Alison Krauss on German TV – but at that time not yet having a Dobro in the band. But I liked her music very much and bought some of her records. Then later on there was this double AKUS live CD. Suddenly I came to appreciate this fantastic sounding instrument called Dobro especially on the solo pieces “Tribute to Peador O’Donnell/Monkey let the hogs go out”. This definitely bowled me over – I listened to it over and over and couldn’t believe the sound and really wondered how it was possible to play an instrument in that way. This was definitely the starting point for me to delve into this instrument. As I said, gigs in general are rare over here. I’m playing with a guitar player, banjo/mando player, fiddle and bass player. It is really hard to find musicians over here, at least for Bluegrass music who are on the same or similar playing level and at the same time interested in playing in an “organized” band, willing to practice regularly, experienced enough to perform on stage, etc. etc.. You can really count yourself lucky if you can find any musicians over here who are interested in Bluegrass at all and at the same time play an acoustic instrument. That’s the position over here. Fortunately I’ve found such musicians in my area and we are actually practicing hard and already did some nice gigs here and there. SJ: I have had many non-musician friends comment to me that it is necessary to have a “talent” (as in “innate” talent or aptitude) in order to become a good musician. Do you agree with this kind of thinking? How did you get so good, so fast? Do you have “talent” or was it dedication to a practice routine, hard work, long hours, etc? WR: In general I think nearly everybody is able to play an instrument – with or without talent. But of course it is easier for people to learn an instrument more quickly and better if they have an innate musical talent or aptitude. I think it’s like in school, in your job or anywhere else. For some people a certain lesson, exercise or job comes easy – other people have to work long and hard on the same thing. I think I’m somewhere in the middle – I’m not sure how much natural talent I have but I’m a real hard and very ambitious worker – at least in terms of playing and learning an instrument ;-). And I think my advantage is my years of experience in music. I’ve played in cover bands for more than 40 years and always had to copy the electric guitar parts of countless songs. And especially the first 20-30 years there was no supporting material like tabs (I’ve never learnt to read music) so I had to learn all those songs and guitar parts just by listening. This of course trained my ear over the years and now I’m even able to figure out and learn the Dobro parts of a song just by listening and without writing down notes or tabs. You asked “How did you get so good, so fast ?” I think one reason is that about 25 years ago I played Pedal Steel guitar for a few years. I didn’t play this instrument very well and gave it up later on. But some of the technique I could definitely adapt when I took up the Dobro 3 years ago. Especially the left hand technique of how to hold the steel bar plus string damping I was able to adapt very quickly. Meanwhile I have started teaching some students who are learning to play the Dobro from scratch. They’ve never held a steel bar in their hands before and do not know anything about string damping. Consequently they first have to learn all these techniques, which takes weeks, months or even longer. So I think this was a big advantage I had when starting up with the Dobro. Another reason of course is regular and concentrated practising ! Although I have a 5 day week office job, I’m spending a lot of time practising and playing the Dobro. There hasn’t been a single day in nearly 3 years now that I haven’t played at least one or two hours per day – on weekends sometimes 6 – 8 hours. Fortunately I have a very understanding and tolerant wife – it seems I made the right choice 35 years ago ;-). SJ: I am assuming you are self-taught, correct? What learning tools or practice techniques gave you the best results when you were getting started? Did you learn from DVD/Videos, cop licks off of c.d.’s, etc? WR: Yes, I’m mainly self-taught. And at this point let me stress that I’m not a professional player – I think “semi-professional musician” might be more appropriate. 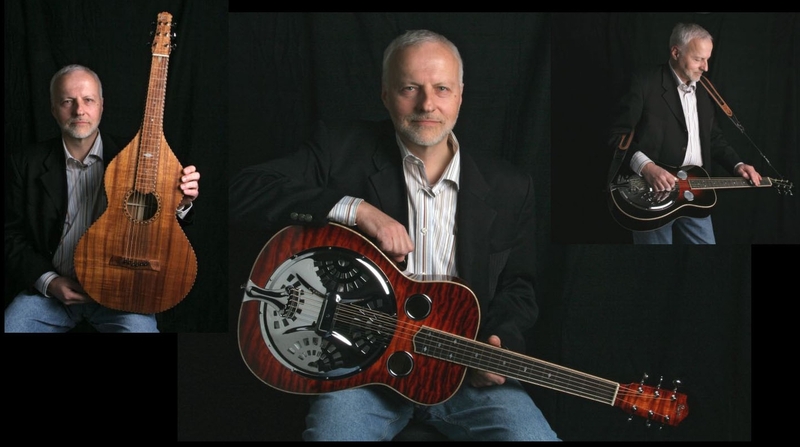 When I started with the Dobro I first bought the Video “Learning Bluegrass Dobro” by Cindy Cashdollar. This helped a lot to get me into this instrument. Other material followed later on, like D. Hamburger’s “Dobro Workbook”, Stacy Phillips “Complete Dobro Player”, Rob Ickes double DVD “Essential Techniques for Dobro” and lot of other material. Not to forget that right from the beginning I started to buy and collect a lot of Bluegrass or Dobro Audio CDs. This kind of music was really new for me – let me remind you at this point that for me Bluegrass didn’t exist for more than 50 years of my life ! Listening permanently to all those CDs was and is still very important and helpful for me to get a feeling for this music and of course to learn and listen to the many different roles a Dobro plays in a song. And each time I find an interesting song, solo or back up I try to copy it as best as I can. The first two years I mainly played just for myself and learnt to play solo songs from Jerry Douglas, Rob Ickes, Ivan Rosenberg, Junior Barber etc.. I practised them to death until I could play them. But for some time now I have been playing in a band and therefore have to focus on different things like back up, speed licks/solos etc.. This is a new challenge of course and broadens my horizon. Anyhow I always tried to be as versatile as possible avoiding getting wound up in a certain thing for too long. Each time I come to a certain point when practising a song, solo or lick I immeditely stop for that day and continue next day or later. One good example: 6 months after starting to play the Dobro, I tried to play JD’s “New Day Medley”. I worked hard on it for several weeks but finally gave up and had to admit that is was to soon and my skills at that time where definitely too inadequate for such a complex song. Two years later my ambitionsness got the better of me and I took up this song again. Believe it or not – within two weeks I figured out how this song worked. What a sense of achievement ! Of course the reader of this interview might get the impression that I’m a pure “copy-machine”. And in a certain sense they are right. And I defintely have to admit that my own creativity on the Dobro still leaves much to be desired. But to be creative on an instrument in my opinion you first have to learn all the muscial and technical basics ! And I think it is quite understandable and useful and defintely not reprehensible to copy as much as possible – above all if you are a beginner. How do you learn a song, a lick, a solo without copying it from a CD or tab book ? I think there are only very few if any musicians out there who never copied ! But I know a few musicians in my area who never cared much for learning basics. And I know that those guys are not happy about it because it definitely limits their real and innate abilities and talents. It took me years to be creative and to find my own style on the electric guitar – but at a certain point after learning all the basics this creativity came to me and my own style automatically. And on the Dobro I still feel like a kind of beginner and I know for sure that there are so many things I still have to learn. But with continued learning I’m convinced that my creativity will improve. SJ: Tell us about your right hand technique: what kind of thumbpicks and fingerpicks do you use? How do you position your right hand…do you curl your right hand fingers up (the Jerry Douglas “ping-pong ball technique”), extend your pinky, etc? Any comments about your right hand technique in general? WR: After using and checking out different picks I finally found out that Zookies L- 20 thumbpicks and metal ProPick fingerpicks work best for me. Yes, my right hand position is similar to Jerry D’s – but this time I didn’t copy him 😉 – it came automatically. Some additional comments: what I definitely adapted especially from Jerry is my thumb technique. I’m now doing a lot with my thumb on all strings. So my thumb is not limited only to strings 4-6 – I’m also using it for the first two strings. Of course what my thumb does depends on a lick or roll but I found out that for many rolls or arpeggios my thumb makes a lot of movement especially on strings 4-6. So, instead of using thumb, index and middle finger for certain rolls I often use only my thumb ! This was definitely hard work to cultivating this playing style but I’m glad that I practised this over and over because I now have much better control and power in my overall playing style. SJ: What kind of techniques do you commonly use to play back up for other musicians? Do you use/prefer chops, chucks, rolls, etc? WR: Depends on the song – may be chops, chucks or rolls – and of course a fill lick here and there. For me backing up is still a challenging matter. I didn’t find much material out there teaching back up so far. So I’m listening to many different songs trying to figure out all the different back up styles and try to copy them or even create my own style. As I mentioned – it depends on the song. SJ: How would you describe your approach to improvisation? Do you think in terms of key sigs, scales, modes, rhythmic variations, etc? WR: It’s a mixture of all the things you’ve mentioned. But rhythmic variations are always very important for me. Playing “static” scales I do not find so interesting and often a little bit boring. My playing style on the electric guitar is also very rhythmic and I applied this automatically to the Dobro. Rhythm is the salt in the soup. 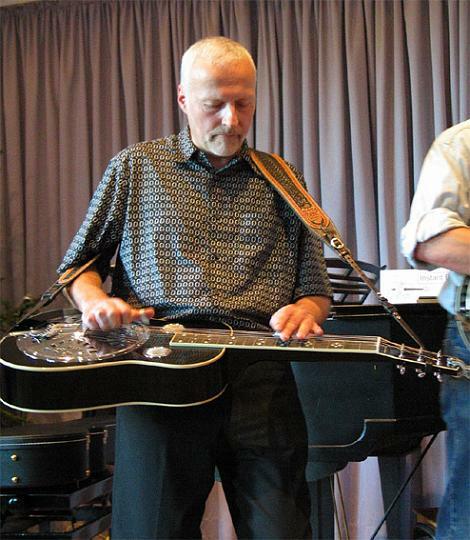 SJ: Tell us about your gear: what resonator, lap steel and Weissenborn guitars do you own? WR: At the moment I own 5 resonator guitars (I’m meanwhile a real Reso-geek), Beard Mike Aldridge Signature, Meredith maple, Meredith mahagony/cedar, Scheerhorn maple R-body and a Moon custom maple from Scotland. There is a very nice Wallace Weissenborn made of walnut and a very old Oahu Diana lap-steel guitar. There is also a very old Stromberg Voisinet and an old Stella – both lap steel acoustic guitars. And last but not least later this year I will get my new Scheerhorn Rosewood/Spruce top after waiting about 3 years. I’m not sure if I will want to or be able to keep all these wonderful but at the same time very expensive guitars later on. We will see. But it would definitely be hard to part with any of them. SJ: I am convinced that many people, especially beginners, place too much emphasis on the instrument; as if all you need to become a good player is the right brand of guitar. What is your view on this sort of thing? How important is a certain instrument to getting “your” sound? WR: That’s a very good and much discussed question. I have played and owned so many different instruments in my life that I think I can really give some informed answers to this question. On the one hand I’m not a professional musician but even for a semi-pro musician like me who did nearly 2.000 gigs so far and earned quite good money in the past, a good-sounding and working tool is a must. I always liked to play a good instrument and good instruments cost good money. I’m talking about electric guitars, guitar amps, effect devices etc.. Regarding the Dobro of course I started as a newbie from point zero. My first Reso was a cheap Regal roundneck, followed by a Epiphone Squareneck, a Gibson Dobro from the early 80’s, a Lebeda Break and a Gibson JD model. For me each of these guitars of course were a step up in terms of sound and playabilty but after a while I always got a little bit dissatisfied because my idea of a Reso sound was different, especially when comparing the sound of my guitars with all the well known sounds produced by all those famous Dobro players. Meanwhile of course I know that even a cheap Dobro can sound quite good on a recording – it depends mainly on the player and recording procedure and quality. Anyway, at that time I was still searching for a better and stronger sound. My next Reso was the Beard MAS – what a step up !! Suddenly all the song material I had been playing and practising immediately sounded much better ! Later on in February last year I took my Beard with me on my US trip where I had the opportunity to compare it with many other guitars like Scheerhorns, Clinesmith, Wechter, Rayco etc. As a result I decided later on to buy a maple Meredith. This guitar is now my first choice especially when playing with my band. This guitar really has the punch, loudness, clear and differentiated sound which comes very close to the ideal Reso sound I’ve had in mind. Of course I still like the Beard very much but in a band the Meredith is stronger and makes itself heard better. Coming back to your question. I think the brand of a Reso is not essential to becoming a good player – it needs much more than that. From my point of view you need a little bit of talent, a lot of ambition, perseverance and above all the strong will to learn this fascinating instrument. And I’m convinced you can become a good player even playing the cheapest available Reso guitar on the market. Imagine Jerry D. or another famous player played a song on a 200 $ Reso guitar – I’m 100% sure that everybody would be amazed about his playing and the sound ! But on the other hand a good instrument defintely helps, and for me a good sounding instrument is a source of satisfaction in itself. And I’m really thankful that I can actually afford such nice albeit expensive instruments – but believe me I have worked really hard for it the last 30 years. SJ: Please detail your “live” rig? Pickups, microphones, electronic gear, etc? Can you give an advice to our readers on getting a good tone through a P.A. system? WR: My Meredith is equipped with a Schertler BASIK pickup system. For me this is the best sounding system I have heard so far. I have tried Fishman, McIntyre and some other Pickups, but the Schertler produces the best sound for me. In some cases I use an Audio Technica Pro 35X clip mic on my coverplate or a simple Sure SM57 on a mic stand in addition. As a monitor I’m using a Roland AC-60 amp. This amp is able to handle both signals from the Schertler and mic at the same time. There might be better amps on the market but I’m quite satisfied with this versatile Roland amp. Good value for money. SJ: Your recordings have great sound quality: please detail your recording gear. Can you give our readers any advice on how to get good sound quality on home recordings? Is there anything you have learned along the way that you want to pass along to someone who is new to home recording? WR: Frankly speaking I’ve tinkered a lot with recording over the last few years. And believe me, often enough I was dissatisfied and frustrated with the result – especially when comparing it with the punchy and powerful sounds on many recordings. Music is only a hobby. I’m not a skilled sound engineer – so my method was always based on trial and error. And recording acoustic instruments was also a new experience and challenge for me. Neumann TLM103 mic, SPL Channel One Mic-preamp, ROLAND VS- 2400CD Harddisc-Recorder. Mastering at the very end on PC with STEINBERG WAVE LAB software using only Peak Master and for convertion from Wav-file to mp3. First of all it is important to get a good and clean signal onto your recording device such as a HD-Recorder or PC. In the past I often tried to compensate or push up a weak basic signal with various dynamic and effect processors afterwards. This is definitely the wrong way and will rarely lead to a good result. I’m using the built-in effects of the Roland HD-recorder – they are quite sufficient for home recording. So I’m using a compressor and equalizer plus Reverb. That’s all ! But the combination of a good compressor and EQ brings a lot of punch and power to the overall sound. Not forgetting to bring the final signal to 0 DB – I do that with the Peak Master of my WAVE LAB software. I nearly forgot: of course it is also very very important to use a good monitoring. For a certain time I only used headphones for the mixing – because it sounds so nice ;-). This is definitely the wrong way and also rarely leads to a good result over a speaker system later on. But I don’t think you need a very expensive monitor system – two small active monitor speakers for a few 100 bucks will do the job. The market is full of such monitor speaker systems. So I’m still experimenting with recording and I’m sure there is still enough room for improving the sound and my skills. But I think I’m on the right pass. SJ : I’d like to close by asking for your comments on musicianship and creativity: What inspires your creativity as a musician? What are your plans for the future, what are your long-term goals as a musician? WR: Listening to all kinds of music inspires me at all times. It can be a simple groove or melody line on the radio or TV or anywhere else. Immediately I develop my own idea in my head – but unfortunately often I forget my idea afterwards and cannot recall it later on. But even this process going on in my head is fun and is a kind of creativity and at the same time mental recreation for me. There is always music in my head even when I’m not translating each and every idea into real sound on my instruments. My plan for the future is definitely to continue working on my playing skills as much as I can – I’m sure and hope that there is still enough room for further improvement. I hope that my band will stay together and that we will get the chance to present our music to the public more than we are doing at present. But we are on the right track – there are several gigs coming up the next months. By the way, this band had quite a new idea of combining quite well known Bluegrass songs with our own written lyrics in a quaint old regional German dialect called “Low German” which is still common in certain parts of the area where I live. Hopefully we can establish the Bluegrass music over here with this unique idea. Besides this Bluegrass project I recently joined a cover band playing all that rock stuff I’ve played so many years. So I took my electric guitar out of the closet, wiped off the dust and plugged it into my Marshall amp. It’s really great to have the opportunity to play in two completely different bands. The contrast between sweet acoustic and loud rock music is fascinating. And above all my playing style and skills defintely benefit from both kinds of music. I don’t know if the term “ cross influence” is the right word for it but defintely I feel some influence from the Dobro when I play electric guitar and vice versa. Furthermore I will now have the chance to bring in my OAHU DIANA lap steel. This guitar in combination with a 100W Marshall produces an absolute killer sound. Here we go – back to the roots ! It was an honor for me to be interviewed on your website, Rob. Thanks a lot.